The way I see it, the transition from little kid to big kid happens when baby teeth start falling out. Gone are the cute little smiles, and in come the awkward, braces-are-inevitable, too-big teeth. I've silently wanted Paige to keep her little kid status as long as she can. Paige, however, was sooo excited when one of her teeth started wiggling. When I saw Paige's dainty tooth-twisting, I had a feeling I'd eventually have to get in there and give it a yank. Given my aversion to, and queasiness from, all things body-related, I wasn't quite sure I'd be able to do it. Luckily, I didn't have to. I was spending a rainy and cold morning working at the Downtown Farmers Market when Traci sent me this picture. 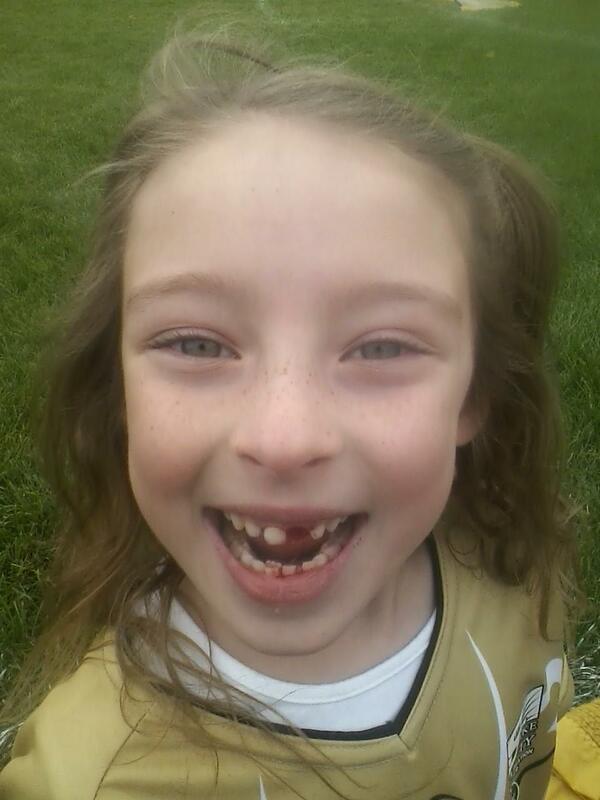 Paige was at her soccer game when her 18-year-old aunt asked her if she wanted her to pull her tooth out. Paige nodded in the affirmative. With one swift tug, Paige had become a big kid. Smiling with a broad, bloody smile, she walked over to get her team picture taken. She was still smiling when I got home from work. "Dad, I read in Junie B. Jones that when you lose a front tooth, you become a big kid." "Yeah, I think Junie's probably right," I replied. Paige couldn't stop smiling. Later than day, I caught her smiling at herself in our bedroom mirror. "Dad," she said, stretching her neck out as high as she could, "do you think I look taller?" I love my big kid. By half time, the Broncos were down 24-0. It looked like this trip to San Diego was just going to be a series of defeats. The first loss had happened just a few hours earlier. Upon the recommendation of the girl at the car rental place, Bert and I headed to Nicky Rottens for lunch. This menu item immediately caught Bert's attention. Clean your plate in an hour an the meal was on the house (plus a free t-shirt and your name on the Hall of Fame board). "Two-and-a-half pounds of meat? That doesn't sound like that much." And with that, he accepted the Ultimate Challenge. While it's possible to imagine six quarter pounders, it's more difficult to picture two-and-a-half pounds of meat in between what was basically two decent-sized loaves of sourdough bread. 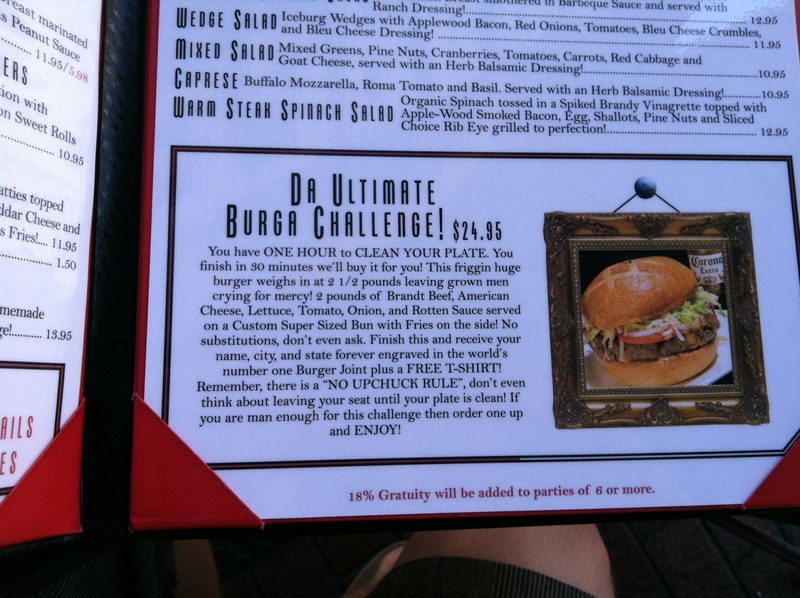 Oh, and apparently Bert didn't read enough of the fine print to know that the fries were also included in the challenge. The waitress set the one-hour clock, rang the opening bell, and wished Bert well. He needed more than luck. Bert gave it the old college try, but after a half hour of work, he'd barely even put a dent in the burger. This was as far as he got. No t-shirt. No name on the big board. And no free meal (just a $25 bellyache). Talk about a disappointment. But the game was going to make up for the burger mishap. Bert had scored us sweet tickets on the 11th row. Even better, we were surrounded by tons of orange-shirted Bronco fans who were hyped and ready. The Denver fans, however, quickly grew silent. Fumbles on two straight kicks. Payton Manning and the boys consistently going three and out. 24 straight first half Charger points. There was nothing to do but stand, cross-armed, and take it as the drunken home crowd jeered and taunted. We came all all this way for this? Luckily, games have two halves. Fumble recoveries. Interceptions. Manning running the hurry-up offense, changing calls at the line, threading the needle. Touchdown, touchdown, touchdown. Broncos fans come back to life. Touchdown, touchdown. 35 unanswered second half points! Bronco fans go crazy. Charger fans slink away in disgust. With about two minutes left, the home crowd started heading for the exits. The Denver fans stuck around, leaving a sea of orange beyond. With all of the singing and cheering, it was like the Broncos were the home team. It looked at sounded a bit like this. By this point it was about 10:00 p.m. Bert looked at me and told me he was a little hungry. I've loved the Denver Broncos as long as I can remember. 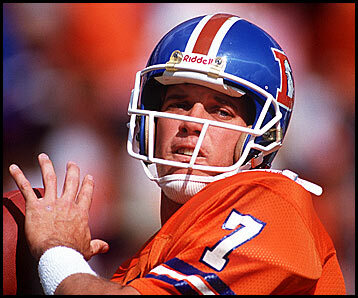 I was John Elway for Halloween for like three straight years. When I was seven, I sat in my room and cried after the Broncos lost the (first of three) Super Bowl(s). In the fourth grade, I tried to change my named to John Elway. My teacher thwarted this plan when she said, "It looks like John Elway got 100% on his spelling test. It's too bad there isn't a John Elway in this class," and then ripped the paper in half. I have never been to a Broncos game. Peyton Manning is no John Elway, but I'll take it. San Diego here I come.